Constructed in 1884 as a roller skating rink, this building was purchase by Peter Blake and opened as Blake's Opera House in 1886. Here audiences enjoyed talent shows, vaudeville, silent movies and athletic contests. Between 1928 and 1984, the Stephens and Mapes families used the building as a furniture store. The Mapes family donated the building for a community center. It was restored by the Grand Ledge Historical Society and the chamber of commerce. Blakes Opera House is a two-story, rectangular clapboarded, gable-roof building located at the corner of South Bridge and River Streets near the south end of the M-100 bridge over the Grand River in Grand Ledge. Measuring 40 feet wide by 150 feet long, the opera house consists of two sections, including a two-story cross-gabled addition anchored onto the rear by a one-story connector. The main western facade has a false front with a semi-circular pediment and a bracketed cornice. Forming the entrance on this facade is a double door with a rectangular transom light and a flanking pair of four-over-four double-hung windows. The lateral faces exhibit a series of similar windows. The added two-story, gable-roof building at the east end follows the simple Victorian styling of the main building. Flaunting a sequence of six double doors embedded in a wall of custom split stone, the refurbished basement level, currently houses office spaces and conference rooms and opens out onto a terrace with a beautiful view of the Grand River. The rear addition features a one-story wrap-around veranda with a spindled balustrade. During the restoration a brick addition was removed, additional roof trusses were added and a basement was excavated the length of the building to support the sagging floor. Seeking to capitalize on the prospering Grand Ledge resort trade, Joel L. McPeek, an area businessman, and Edgar Marvin, a pioneer photographer, hired Russell F. Tinkham to build the Riverside Rink at 121 South Bridge Street in 1884. One of the first roller rinks in the area, the Riverside Rink opened on August 15, 1884. After a year in operation, McPeek sold his interest in the business to Peter Blake, owner of an Eaton County cheese factory. Within months, Blake bought out Marvins share to become sole proprietor of the rink in 1886. 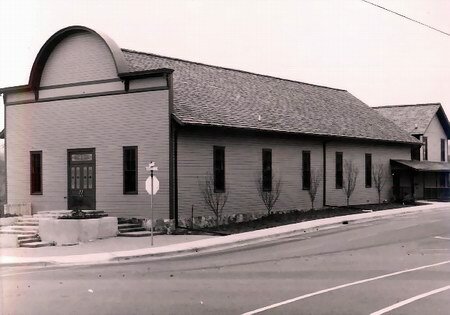 Later that same year on March 12, the Grand Ledge Independent revealed Blakes plans to convert the skating rink into an opera house. Blake commissioned Charles LaFont, a scenic artist from New York City, to construct the portable stage and scenery painted on rolls of canvas suspended from the ceiling, while Tenie Rall, a local craftsman, adorned the walls and ceiling with decorative paperhanging. With the Mackley-Salisbury Comedy Company as its featured act, Blakes Opera House opened on May 12, 1886, and signaled the start of the Golden Age of Grand Ledge. In 1976 the former opera house, dubbed Heritage Hall, was the Bicentennial Committees headquarters. In 1984 the Mapes family, who had purchased the building and used it as a furniture store, donated the structure to the Grand Ledge Area Historical Society to house its growing historical collection. Shortly thereafter, the building was donated to the Opera House Authority who wanted to restore the structure. Since completion of the restoration, the opera house has been used for class reunions, weddings, senior citizen events, auctions, crafts shows, conferences and seminars, as a visitors information center and as chamber of commerce offices. Architect Fred Dawe, from the firm of Stein, Winkle, Dawe, Wood & Johnson, Ltd. , in Lansing, headed the restoration project.